Ivory Coast won their first match of African cup of Nations 2013 against Togo by 2-1. This was the match of Group D held on Royal Bafokeng Stadium on January 22, 2013. Ivory Coast’s Yaya Toure scored the first goal within ten minutes of start of the game. However, the Togo team did a superb come back when Jonathan Ayite did a goal just before half time. Ivory Coast’s forward Gervinho did the goal with two minutes remaining, is what gave the team a lead and victory over Togo. Ivory Coast who is among the favorites to win the current year’s title will look to win other matches and move ahead with lots of confidence that they would gain out of this victory. 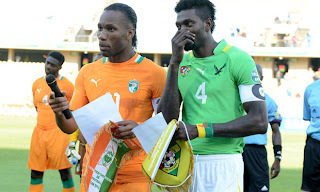 0 Respones to "Ivory Coast defeat Togo 2-1"